How high can a vacuum pump raise water? Who first argued that vacuums were impossible? This is untrue, nature does not abhor a vacuum. This was later rendered in Latin as horror vacui and rephrased as Natura abhorret vacuum by Francois Rabelais (1494-1553) in his novel Gargantua, published in 1534 (although it was not a philosophical or scientific work, the expression stuck). I once saw a cistern which had been provided with a pump under the mistaken impression that the water might be drawn with less effort or in greater quantity than by using an ordinary bucket. The pump had its sucker and valve in the upper part so that the water was lifted by attraction and not by a push as is the case with pumps where the sucker is placed at the bottom. This pump worked perfectly so long as the water in the cistern stood above a certain level; but below this level the pump failed to work. When I first noticed this, I thought the machine was out of order; but the workman I called in to repair it, told me the problem was not the pump but that the water which had fallen too low to be raised to such a height; and he added that it was impossible, using any machine operating on the principle of attraction, to lift water above eighteen cubits; this is the limit of the lifting power of attraction. Galileo noticed that nature abhorred a vacuum but only, it seemed, to a height of 10m (33ft). Many have said that a vacuum does not exist, others say that it does exist despite the repugnance of nature and with difficulty; I know of no one who has said that it exists without difficulty and without a resistance from nature. I argue that: If something can be found that explains the resistance we experience when trying to create a vacuum, it seems to me foolish to attribute to vacuum that which is caused by something else; and from some very simple calculations, I found the cause to be the weight of the atmosphere. … We live at the bottom of a sea of air, which by experiment has weight, and so much weight that the densest air in the neighborhood of the surface of the earth weighs about one four-hundredth part of the weight of water. 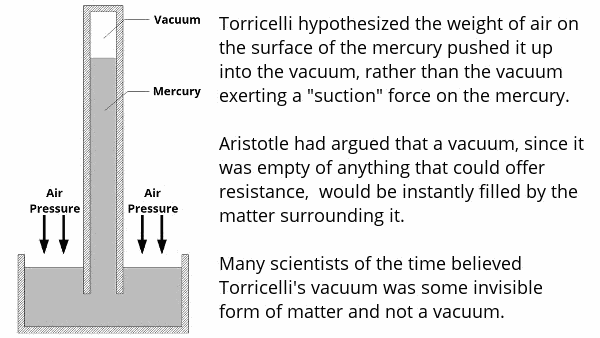 The general scientific consensus of the time followed the Aristotelian view that a vacuum was impossible and therefore Torricelli’s “supposed” vacuum was in fact some sort of invisible matter. I poured 8kg of mercury into a vessel, then took several glass tubes, each 120cm long and hermetically sealed at one end and opened at the other, then placed them in the vessel mercury. I found the mercury stood at 711mm above the mercury in the vessel. This showed that weight of the air pushing the mercury into the vacuum was less at the top of the mountain than at its base. Dr. Deusingius should bear in mind that the air does not just press on our heads; it flows all around us pressing from above on the head, and likewise pressing on the soles of the feet from below and all around the body at the same time. 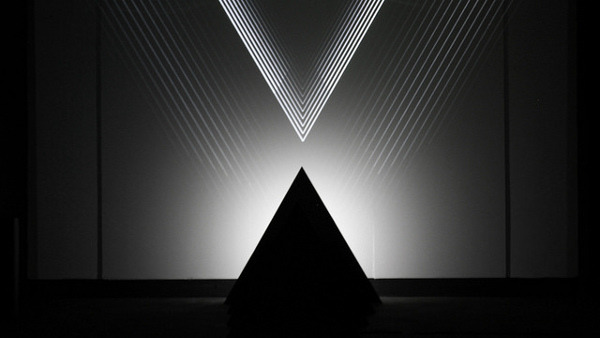 In fact, it is the body which fills space, and air which fills the remaining empty spaces. Just as the fish in water do not perceive the pressure around them, we perceive even less the pressure of the air around us.